We hope you’ll join us for our very first “Gospel Conversations” GROW class! If your faith is important to you, but you often find yourself stuck when it comes to sharing your faith with others, this class is for you! In this class, we will explore not only the many important reasons why we share our faith, but we will get very practical and equip you with many tools for how to share your faith! If you feel like Mosaic Church may be the community God is calling you to, then the Foundations Class will help you come to a better understanding of what we believe from a theological and doctrinal standpoint. Who is God & what is His purpose behind creation? What is original sin & what was God’s response to our rebellion? What is water baptism & how are we to live in light of God’s grace? Who is the Holy Spirit & what is His role in our lives? What is true worship & how do we mature in our worship? * This class is full but you can still register for the one offered during our third service at 11:30 am. Click here to register for the third service class. Philippians is a tender letter of loving encouragement from the apostle Paul to his favorite church. If offers guidance for Christians today on how to live in Christ unitedly, joyfully, and victoriously in a “post-Christian” society. 11may10:00 am2:00 pmMosaic Olympics 2019Who will bring home gold? We’re excited to host our 2nd annual Mosaic Olympics! Last year was such a blast, we’re excited to enjoy another year of competition and fun together! Your knowledge, problem solving, teamwork executing, and physical stature skills will be pushed to their limits to decide who this year’s champion will be. Teams will be determined by community groups so now would be a good time to start inviting people. Want to take home the gold? Then make sure your community group leader registers your team! Your community group leader will receive all the information you’ll need to know regarding the competition and potluck BBQ. Not part of a community group yet? You still have time. Visit our Community Group Directory to find one. A Baby/Child Dedication is a ceremony that takes place during our worship gathering in which believing parents, or guardians, make a commitment before the Lord and the church community to submit a child to God’s will and to raise that child according to God’s Word (Deut 6:4-9; Prov 22:6; Eph 6:18; Heb 10:24-25). We believe the home is the primary place of instruction and as a community of believers we should support and assist the parent’s commitment to Christian instruction and lifestyle (Eph 5:4; Col 3:21). Dedication is not salvation or baptism, it is a covenant with God and the church family concerning your desire to raise your child for God’s glory. Affirm your faith in Christ. Regularly pray for God’s direction in your lives and in the life of your child. Faithfully engage God in Worship with your child. Teach your child the truths of God’s Word in your home. Anticipate and seek to lead your child to a personal faith in Christ as soon as they are ready. Recognize that your child belongs to God and has been born to experience His love and to serve Him. Be a covenant member of Mosaic Church in agreement to the beliefs, values and statement of faith. Join us for Mosaic Women’s Around the Table. On Friday evening from 6:30 pm – 8:30 pm, Mosaic women around the city are opening their homes and inviting you to join other women where they live around the table to share friendship and a fresh perspective on how we can do life together. Come join the men of mosaic in our parking lot for a night of grilling, games and guy time. No agenda, no speakers…just set aside time to be in community together as we gear up for this year’s Men’s Retreat on August 22-24. Childcare is provided if you register. Available for those who register for it. Do you know the voice of God? You have probably heard people say God spoke to them about this or that. In John chapter 10 Jesus says that his sheep hear his voice. So how do we do that? How do we know if it’s God’s voice or our own? How do we “walk in the spirit” as Galatians 5 puts it and live by every word that proceeds from the mouth of God. If you have ever asked yourself these questions and want to learn more about how to hear the voice of God and how to follow his leading, we invite and encourage you to join us for this GROW class! – How to move beyond the black/white binary and learning how to discuss issues around race with your fellow church members, friends, family, neighbors and coworkers. This class is open to everyone, but is highly recommended for anyone who came out of a homogeneous church background. If Mosaic is your first stop in a multiethnic church environment we strongly recommend this class to you. Also, for those of you who have attended any of our Large Forum TGA meetings and have wanted a place to go deeper, this is your place! This class is free of charge but be sure to register soon, as space is limited! FREE — That means you can bring all your friends and not pay a dime! The Membership Class is a class on a Sunday morning that allows you to get better acquainted with the mission, vision, and leadership of Mosaic Church. We discuss our basic beliefs, our unique identity, what you can expect from our elders and leaders, how to get connected into the different ministries, and what it means to be a Covenant Member. Attending this class does not make you a member, but simply helps answer questions you may have in regards to who we are and what we’re about. Prior to attending the class we invite you to learn more about our beliefs and who we are by checking out our About Us page. This class has limited seating. Whether you’ve been married a few months or many years, all marriages need attention and care to fully thrive as God intended. This Grow class will challenge and encourage your relationship as we look at fundamental topics like God’s design for marriage, communication and conflict, finances and intimacy. Practical tips will be combined with Biblical wisdom in hopes that your marriage will be strengthened and enriched as you attend. Understanding the Bible isn’t just for the scholars, seminary students or pastors. It is accessible to all. It is meant to be read, studied, and understood. The Bible is our spiritual food and it should be feasted on regularly! This class will teach you some helpful tools to study the Bible for yourself. You will learn how to apply the timeless truths to your life today, and it will help you develop discipline of Bible study so that it becomes not only a desire, but ultimately a delight. One of the things we value within community is fun. In the midst of all the pressures life throws at us, it is our ability to laugh, play and celebrate together that reminds us we serve a good, loving, and resurrected Lord who stands above it all. So, we want to take the first few minutes of our time together to play, have fun, and celebrate the fact that we belong to Jesus. The group will need to be up for a challenge with this simple, but incredibly fun game. Stand Your Ground combines balance, reflexes and quick wits to succeed and is a quick game of elimination. Your group will pair off in groups of 2. At the end of each round the winners will then pair off for the next round and on and on until the final 2 are left for the championship round. 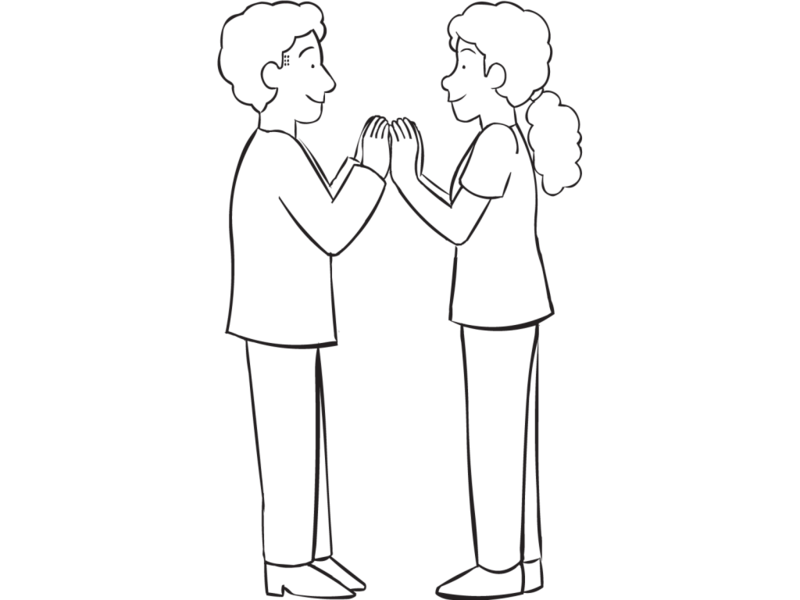 The two people stand facing each other. Their hands should be able to touch palm-to-palm with elbows bent at 90 degrees. Each person’s feet should be shoulder width apart to provide a good base. They must try to make the other player move their feet (falling backward or falling forward) by slapping/pushing their opponent’s hands (kind of like playing patty cake) or by moving their hands out of the way as their opponent tries to slap/push theirs. Touching anywhere else, moving feet, falling, interfering means disqualification. The first person to move their feet loses. If you have time and feel this would help the new people in your community group better understand what you are trying to accomplish as a group then take 2 minutes to show this video. We are continuing our new series entitled Great Faith. We will be joining thousands of Believers in nearly 60 different countries within our Every Nation Church Family in preaching, praying and fasting as we seek to discover what great faith is and why having faith even matters in the first place. That word, ‘faith‘ can mean a lot of things to a lot of people based on upbringing, church experience, and personal struggles. But, what does the Bible mean when it uses the word faith? And why was Jesus continually amazed by either the presence or lack thereof, when it came to faith in people’s lives? Let’s find out together. What is one of your life’s dreams? How would you describe Lewis’ mindset and experience in his loss? Have you ever lost something or someone you loved that left you feeling this way? How did that loss affect your view of God? Yourself? Others? “And when he had lifted him and brought him to his mother, the child sat on her lap till noon, and then he died. 21And she went up and laid him on the bed of the man of God and shut the door behind him and went out. 22Then she called to her husband and said, “Send me one of the servants and one of the donkeys, that I may quickly go to the man of God and come back again. How did the woman respond to the loss of her son? How did Elisha respond to the loss of her son? What does this teach us about how we handle and respond to the loss of loves and dreams in our own lives? What if God doesn’t resurrect that dead thing in our lives? How do we respond then? What role should Christian community play in our suffering? How does knowing you’re not alone in the pain of your loss affect the way you go through that loss? What is required for us to enter into both the joy and the weeping of others? How might our trusting God with one another in the midst of loss impact the world around us for God’s Kingdom?